Do not exceed a total load of 10 lbs to each rack pair. 1 Align the assembly to the garage door panel by tilting it slightly, placing the garage door lip between the clamping block and assembly foot. 2 Rotate the assembly to a vertical position, slide assembly to desired position and tighten wingnuts finger tight (no tools required). 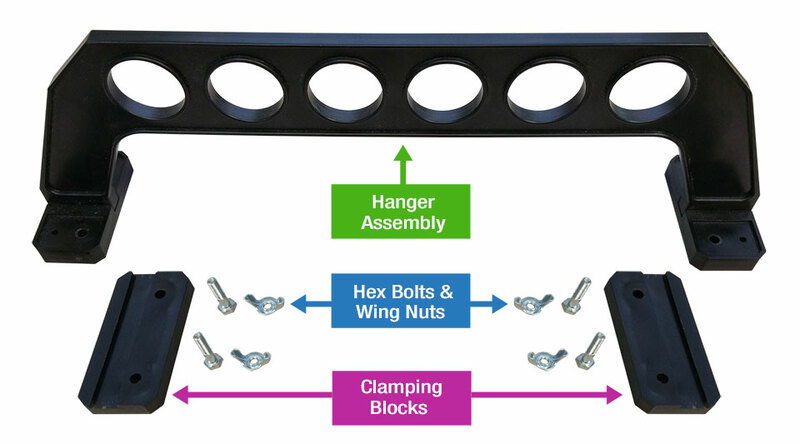 If the hurricane bar is greater than 4”, spacers and longer bolts are required. 3 Install the other hangar assembly in the same manner and to the desired width to fit your equipment. Do not position the assembly feet directly above or below each other. Place equipment in rack. The rod assemblies can be hard mounted to garage doors, walls, ceilings, doors, boats and other flat surfaces by removing the clamping block/hardware and attaching the assembly feet directly to the surface utilizing the existing holes in the hangar assembly feet. For the garage hard mount use #8 x 1-1/4” hex head self-tapping screws. Align the feet/assembly to the desired width and location on the garage door panel and simply screw in. Do not overtighten. For wall and ceiling hard mounting use regular wood screws to attach the feet/assembly to the desired location in the studs.